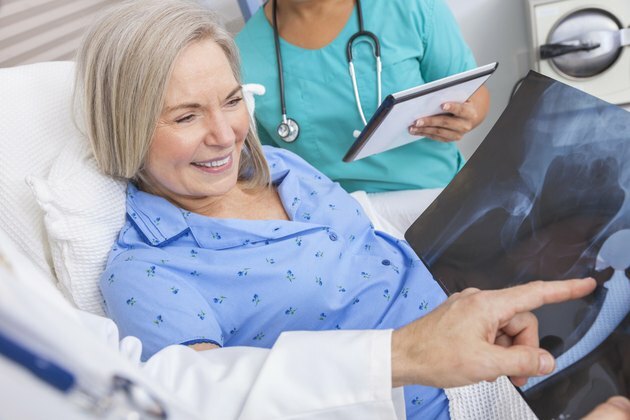 Hip osteoarthritis is a debilitating condition caused by wearing down of the cartilage, or padding, in your hip joint. Walking causes severe pain as the bones in this ball-and-socket joint rub together. Joint replacement surgery is performed to decrease pain and improve mobility. After surgery, exercises are performed to improve movement and strength, usually under the direction of a physical therapist. In most cases, precautions must be followed after surgery to avoid movements that increase the risk of hip dislocation. Exercises after hip replacement progress in phases. The first phase begins as soon as the first day after surgery. Exercises are performed while lying in bed or in a seated position. Ankle pumps -- moving your ankle forward and backward -- are started immediately to decrease the risk of clots caused by blood pooling in your legs. Other exercises include bending and straightening your knee and isometric strengthening of your thigh and buttock muscles, which means tightening your muscles without actually moving your leg. Some standing exercises may be initiated if your doctor allows weight bearing on your leg. Phase 2 exercises are performed for 1 to 6 weeks after surgery. These exercises focus on strengthening your hip muscles -- particularly the ones that move your leg out to the side and backward. Stationary biking or upper body cycling may be added for endurance. Sit-to-stand exercises are performed to improve mobility. Standing exercises are progressed to include walking backward and on uneven surfaces to improve balance. Step ups, mini-squats and sidestepping are also usually incorporated. Phase 3 continues with exercises performed in phase 2, using strap-on ankle cuff weights or elastic bands for added resistance. This phase typically occurs 7 to 12 weeks after surgery and continues to focus on improving balance, walking speed and endurance. Exercises may include treadmill or pool walking. Your surgeon may also allow you to resume some recreational activities, such as swimming. Twelve to 16 weeks after surgery is the usual time for phase 4 of your rehabilitation after hip replacement surgery. Your doctor may allow you to resume recreational sports during this period. Functional exercises such as pushing, pulling and squatting are incorporated, particularly if you are returning to work. Endurance exercises continue, with gradual increases in time and speed. Formal rehabilitation is often complete within 6 months after hip replacement surgery. However, functional limitations -- not being able to perform some tasks and activities -- may continue for more than a year. Your therapist may give you a home exercise program to continue indefinitely to maintain strength and range of motion after you finish rehabilitation.